By the early 2000s, NASA was already envisioning, in broad strokes, of what might come after the Space Shuttle program; while serving as an enduring symbol of America's space pioneer spirit, the Space Shuttle program was simply too expensive to maintain and accounted for too much of NASA’s yearly budget. The Space Shuttle Columbia disaster brought this topic to a head and accelerated NASA’s retirement plans for the Space Shuttle. Ultimately, these discussions cumulated in the NASA space plan, Vision for Space Exploration, which became the cornerstone of NASA’s space policy under President George W. Bush. As a part of the Vision for Space Exploration, NASA planned to develop a new deep space exploration vehicle that will empower the United States to return to the moon by 2020. Eventually, a semi-permanent moon base will be established to serve as the staging grounds for deep space exploration missions. Onboard the USS Constellation, then-NASA administrator Sean O’Keefe officially unveiled this new human spaceflight program by noting that this new vision will accept “the spirit of the original Constellation and proudly transfer it to [a new] class of space vehicles that will carry humankind back to the moon, Mars and beyond.” Thus, the Constellation Program was born. As “Apollo on steroids,” the Constellation Program had grand ambitions to take the United States back to the glory days of the space race when America became the first nation to land humans on the moon. In order to achieve its deep space exploration objectives, the Constellation Program envisioned the creation of two new rockets: Aries I and Aries V (names that signified the program’s goal of reaching Mars) and a new gumdrop-shaped capsule: the Orion (a nod to the program’s name by invoking one of the brightest constellations in the sky). Similar to the Saturn rockets that took the Apollo Program to the Moon, the Orion capsule was to launch into Outer Space on top of the skinnier Aries I rocket. Meanwhile the heavier Aries V rocket would have served as a cargo payload system, delivering all of the necessary supplies for deep space exploration. But during the 2000s, NASA was trying to achieve these ambitious goals with less than half of the funding that the agency had during the space race. Inevitably, for the Constellation Program, these budget shortcomings led to additional delays which led to more budget overruns which led to more delays. Additionally, with NASA’s budget chronically underfunded, the Constellation Program was absorbing more and more of NASA’s overall budget, leading to more and more critics of the program inside and outside the space agency. With President Obama’s election in 2008 and a semantic shift away from the original supporters and creators of the program, the Constellation Program was on its dying breaths by early 2010. The death knell for the Constellation Program officially rang in NASA’s fiscal year 2011 budget, where the projected five-year budget expense for the Constellation showed all zeros. The Obama administration wanted to pivot NASA toward efforts in the research and development of innovations and new technologies, areas that were more difficult for private sector companies to sink money into; essentially, President Obama’s space policy envisioned a collaborative effort between the public and private sectors: NASA would create and invent the foundational technologies that would enable private space companies to develop the next generation spacecrafts that will take humanity to new and unexplored territories in Outer Space. Through this synergy, the U.S. government would jumpstart the private sector and sustain the entrepreneurial spirit and success. But because the Obama administration cancelled the Constellation Program without seeking congressional support or guidance from the aerospace industry, it led to a public revolt. After all, the Constellation Program employed many federal workers in several states across southern United States, and the program’s demise meant many job losses across the board. Due to this prominent backlash, the Obama administration eventually semi-relented and President Obama personally traveled to the Kennedy Space Center in April 2010 to announce the creation of a new heavy rocket that would take the Orion space capsule “to begin the first-ever crewed missions beyond the moon into deep space” by 2025. In the same speech, President Obama also announced goals of sending astronauts to an asteroid for the first time in history, manned orbits around Mars by mid-2030s, and a Mars landing thereafter. Eventually, President Obama’s new space policy resulted in the NASA Authorization Act of 2010, which directed NASA to develop a heavy lift space launch system that can carry payloads beyond low earth orbit “as soon as practicable”. The Act also included detailed specifications for such launch system and recommended NASA to reuse the technology, contracts, and workforce under existing “vehicle development and associated contracts” whenever possible. These directives made it impossible for NASA to design anything other than Constellation’s Aries V launch system. 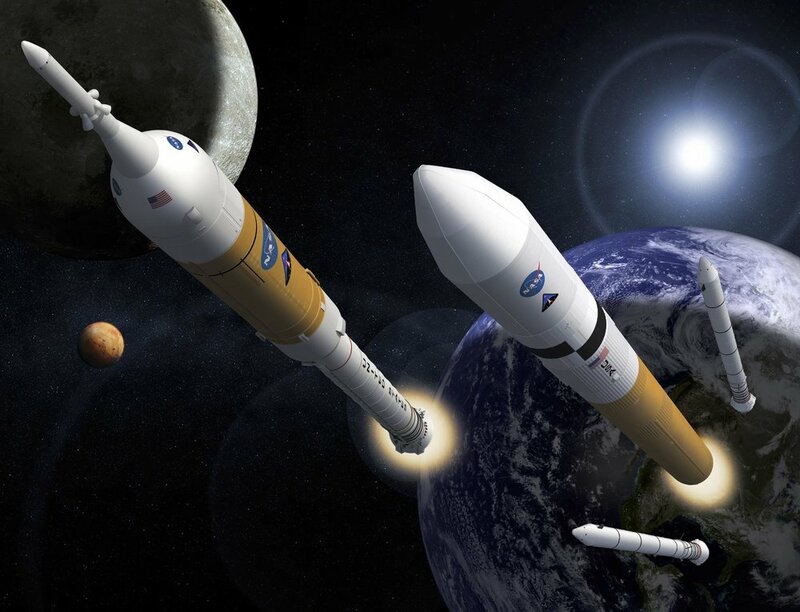 Thus, the Act essentially revived the Constellation Program under a different name: the Space Launch System (“SLS”), a moniker that harkens back to the formal name of the Space Shuttle Program, the Space Transportation System. And just like that, the SLS program was born.